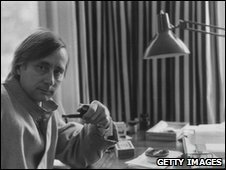 The author Alan Sillitoe has died aged 82 at Charing Cross Hospital in London, his family has said. 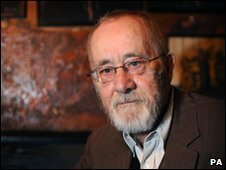 The Nottingham-born novelist emerged in the 1950s as one of the "Angry Young Men" of British fiction. His son David said he hoped his father would be remembered for his contribution to literature. His novels included Saturday Night and Sunday Morning and The Loneliness of the Long Distance Runner, both of which were made into films. He was born on 4 March 1928 - the second son of an illiterate tannery labourer who was often out of work. Later, he described life growing up in a poor household. "We lived in a room in Talbot Street whose four walls smelled of leaking gas, stale fat and layers of mouldering wallpaper," he said. He said his mother burned his first semi-fictional work when he was a 12-year-old. It was about the behaviour of his cousins but she felt it to be too "revealing". Alan Sillitoe's name was made with his first two novels. For the next 50 years he continued to write prodigiously, but nothing he subsequently wrote matched their popularity. That's not to say his form dipped, just that his early subject matter captured the moment of a nation in flux. The establishment the protagonists in his early novels were rebelling against was under attack in real life too. Post-war austerity was starting to give way to youth culture. His social realist writing was categorised as "kitchen sink" drama, meaning Sillitoe was grouped among the Angry Young Men generation of British writers. This was a classification he always rejected - a sentiment echoed in the famous words spoken by Arthur Seaton in Saturday Night and Sunday Morning: "Whatever people say I am, that's what I'm not". A line picked up by the Arctic Monkeys. He then left school at 14 to work in the Raleigh bicycle factory in his hometown before joining the Royal Air Force (RAF) four years later. He worked as a wireless operator in Malaya but, while in the RAF, he contracted tuberculosis and spent 16 months in hospital where he began to write novels. After travelling to France, Spain and Majorca - where he met the poet Robert Graves - he wrote the pioneering novel Saturday Night and Sunday Morning. Published in 1958, the tale about the life of hard-working factory employee Arthur Seaton won the Authors' Club First Novel Award and received instant critical acclaim. It was adapted as a film in 1960, starring Albert Finney. His story The Loneliness of the Long Distance Runner, focusing on a rebellious boy with a talent for running, won the Hawthornden Prize in 1959. It was also turned into a film, starring Tom Courtenay, in 1962. The award-winning writer was married to the American poet Ruth Fainlight, with whom he had David, and adopted daughter Susan. Although he tended to spend most of his time in London, they also lived in France, Spain, Tangier and Israel. Poet Ian McMillan paid tribute to the author, describing him as a "marvellous prose stylist" whose work had a "kind of Midlands sonority to it". "He was a man who attempted to capture the majesty and drama of ordinary life," he said. "He wrote this great line which said 'the art of writing is to explain the complications of the human soul with the simplicity that can be universally understood' and I think that's what he achieved." Sillitoe rejected the celebrity life and all he wanted to do "was sit in his house in London and write and write and write", he added. As well as numerous novels he published several volumes of poetry, children's books and was the author of several stage and screen plays. In 1995, his autobiography Life Without Armour was well received. In 2007, he published Gadfly - an account of his travels in Russia. In 2008, he was recognised for his Nottingham roots and given freedom of the city. Earlier this month, along with others with the same honour he was due to herd sheep across Trent Bridge, as was his right. However he had to pull out because of illness. Last year, he appeared on the BBC's Desert Island Discs, where he said if he were cast away his ideal companions would be a record of Le Ca Ira sung by Edith Piaf, a copy of the RAF navigation manual, The Air Publication 1234, and a communications receiver - but for receiving only. Although he once said he preferred to be thought of as a poet rather than a novelist, it was his prose that attracted the more critical success.